I started this blog in 2013 but after 5 years I’m taking an open ended sabbatical sailing around the world on my own sailboat. I’m still doing some freelancing work for one small startup in silicon valley that allows me to pay my expenses, but I’m not actively looking for new clients. The work life balance I have with just one client is perfect for now. A few weeks ago I published a post on how to write and translate for Mobile, where I explained the three Fs approach: Fast, Focus and Fun. Some readers asked me how you can possibly be fun when you design something serious as say, a payment flow. 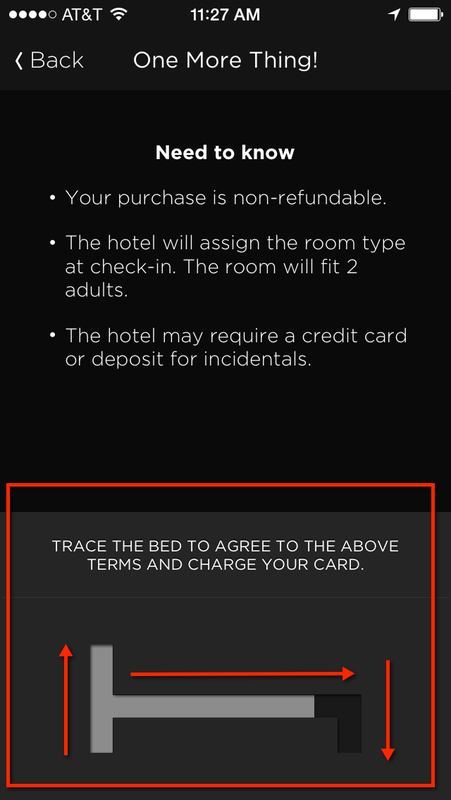 Well, here’s an excellent example from what I consider the best app out there in terms of sleek design and crisp content: Hotel Tonight. Hotel Tonight is a San Francisco’s startup founded in 2010 by Sam Shank, Jared Simon and Chris Bailey. It’s in series D founding round, backed by VCs like, among others, Accel Partners. It’s only on Mobile, their website is just a homepage where you can download the app. If there’s an app out there that abides by the three principles I’ve listed in my previous post, this is Hotel Tonight. 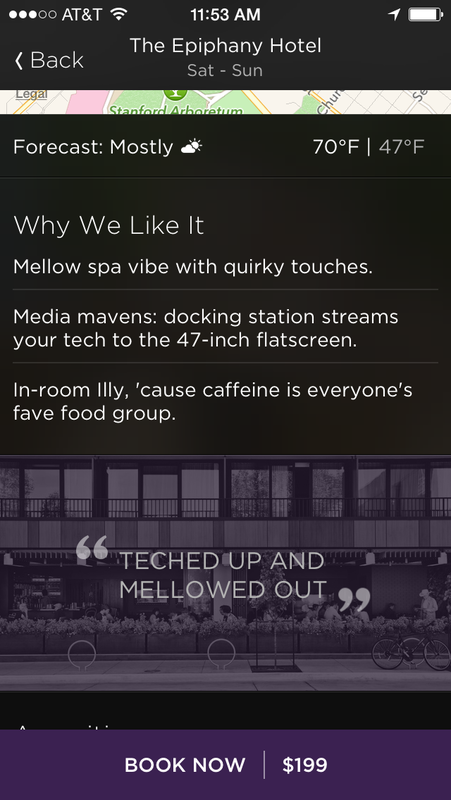 When I’m asked for examples of well designed apps with great content, tone of voice and style, Hotel Tonight is the first (and finest) example that comes to my mind. Oh, and one more thing! The app works really well and the deals are fantastic! Please feel free to post other examples of apps with sleek design and great content! 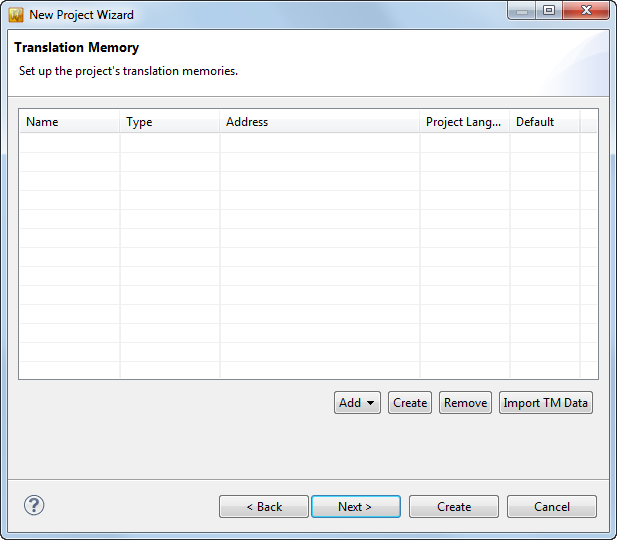 1) Create a translation project importing a xlif and an MS Word file. 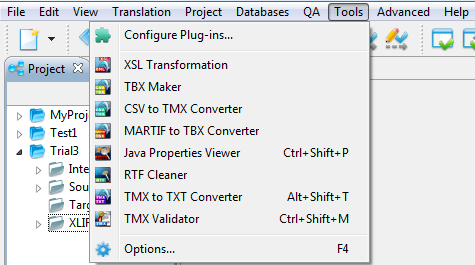 2) Create a new TM and import an existing one in both TMX and TXT format. 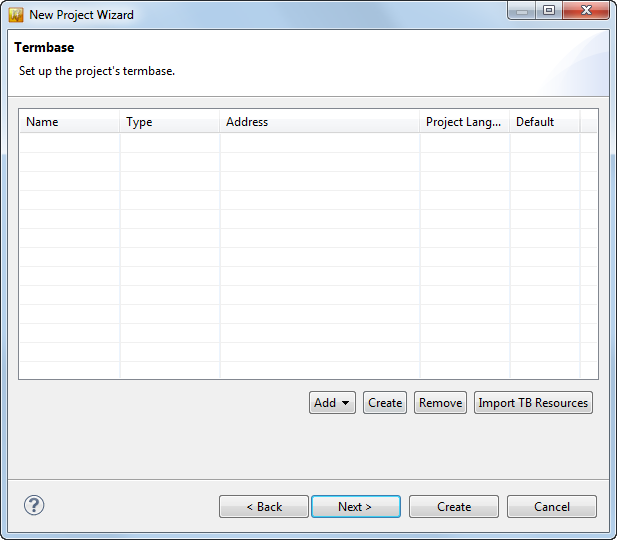 3) Create a new TD and import an existing one in TBX format. 5) Search a term in TD and TM. 6) Observe TM and TD results. 7) Run a concordance search. 9) Check numeral and tags consistency. Unlike all other commercial tools available today on the market, Heartsome Translation Studio runs on a Mac! The User Interface is very sleek and the views can be customized according to your personal preferences. 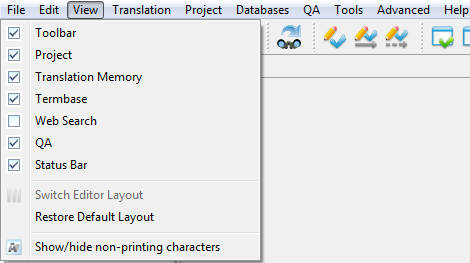 The translation happens in a grid, like in Trados, Déjà Vu or MemoQ. The segment’s filter offers a good number of options and it can be customized. The toolbar is not too crowded with unnecessary options. This tools work very well and are quite handy. 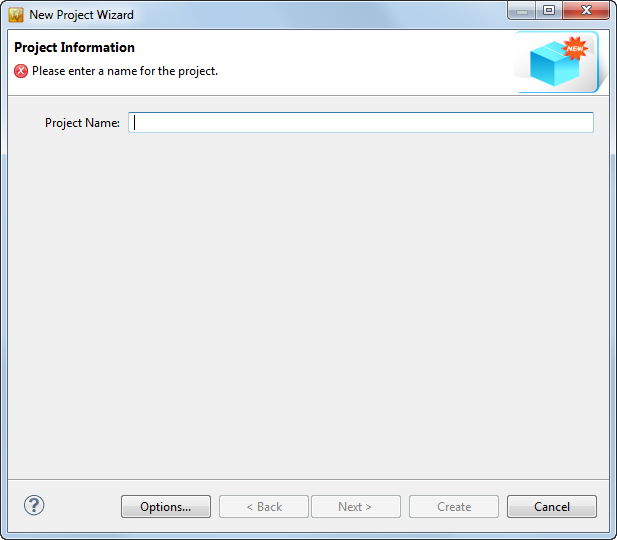 Practically your projects are saved in this default position: C:\Users\username\Heartsome Workspace\, where you have the folders Intermediate, Source, Target, XLIFF. I mean, is not as bad as Trados Studio, but there’s got to be a more intuitive way to handle this. 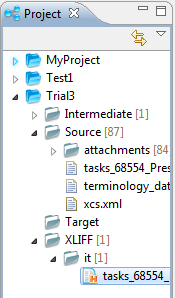 Another way to open a file for translation, is by dragging it directly into the Source folder under the specific project. I hope that someone is going to simplify this process. Another annoying behavior is the Export feature. 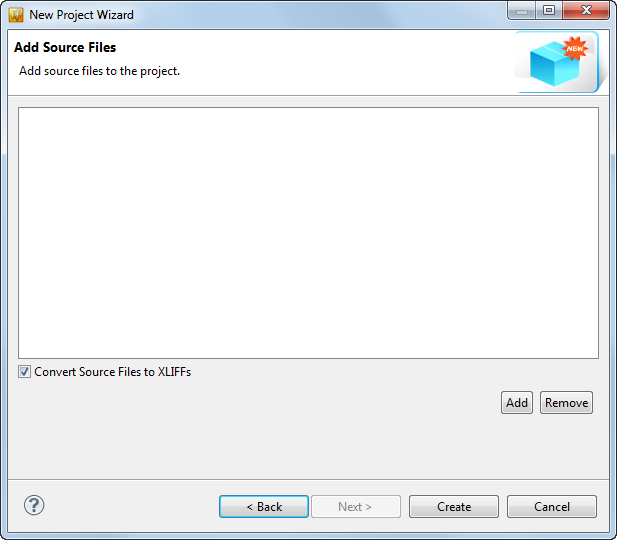 When you’re done with your translation/review and you need to deliver the project back to the requester, you need to click on Project > Export Project and then select the path where you want to export a funky .hszip file, that is nothing more that a zip archive that needs to be renamed into .zip to be opened and that contains a Xliff folder with the .hsxliff file. 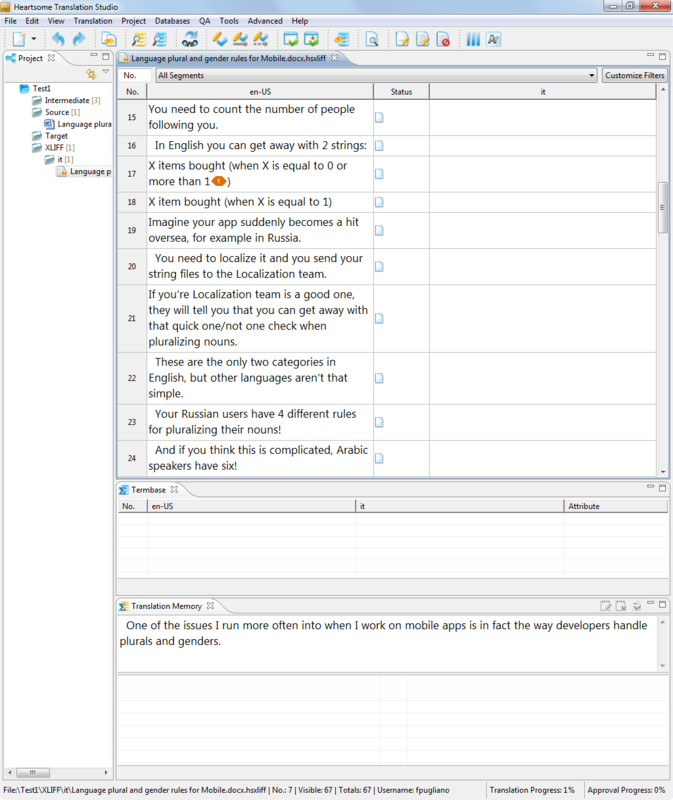 Overall, Heartsome Translation Studio is a very good tool that could potentially became an excellent one with some simple User Experience improvements. At the moment there’s only one contributor on GitHub, but it’s true that this tool become Open Source just a few months ago. The UI looks sleek and the tool is robust (never experienced a crash). It has lots of potential, and could easily take over Trados Studio if more developers start contributing. So watch out for Heartsome Translation Studio in the future! In my next post I will be reviewing Omega T+. Stay tuned! I took the time to compile an extensive list of CAT tools available on the market today, both commercial and Open Source. The goal is to compile a gap analysis and a comparison review. I’d like to close 2014 writing about one of the hottest topics: language plural and gender rules. One of the issues I run more often into when I work on mobile apps is in fact the way developers handle plurals and genders. I’ve had the opportunity to raise this issue with many apps developers and designers lately, and I was surprised to learn that unfortunately very few of them are aware of the complexities of other languages and the way to tackle this kind of problem. In my opinion, it is paramount for Mobile developer and designers to think ahead about their global audience and build these language plural rules in their apps since the very beginning. I’ve been insisting a lot on this, because internationalizing the strings of their apps retroactively is a lot more work than doing it incrementally throughout development. And more costly too. Imagine your app suddenly becomes a hit oversea, for example in Russia. You need to localize it and you send your string files to the Localization team. If you’re Localization team is a good one, they will tell you that you can get away with that quick one/not one check when pluralizing nouns. These are the only two categories in English, but other languages aren’t that simple. Your Russian users have 4 different rules for pluralizing their nouns! And if you think this is complicated, Arabic speakers have six! If you want to learn more about plural rules, you can read the Unicode Common Locale Data Repository (CLDR) Project which provide tables and charts that can help developers to handle these cases. The category names (i.e. zero, one, two, few, many, and other) are common across all languages and the rules define the mapping between a quantity and the plural category to use. other ⇒ No rule, or any other number. In the past there wasn’t any option for properly internationalizing your iOS app. The good news is that in mid 2013, Apple released Localizable.stringsdict that provides built-in support for plural and gender rules in the Foundation Release Notes for iOS 7 and OS X 10.9. If you start to use these categories even before you need it, you will be able to reach a global audience faster than you would otherwise, saving yourself a lot of work, time and money!